China is home to the world’s third-largest blood products company, and 1.3 billion people have access to its life-saving products largely owing to the adventurous spirit of Thu Ho ’81 Meecham. A biologist and microbiologist who earned her B.S. at Cal Lutheran and M.S. at Cal State Northridge, Meecham was a laboratory manager at RAAS (Rare Antibody Antigen Supply) in Agoura Hills in 1988 when her boss, RAAS founder and CEO Kieu Hoang, tapped her to help launch the first-ever U.S.-Chinese joint venture in Shanghai. Meecham had never been to China and didn’t speak the language (she’s Vietnamese-American). “But I was single, in my early 30s, and it sounded like an exciting adventure … so why not?” In February 1989 she was on a plane. Shanghai RAAS Blood Products Co., which last year made Forbes magazine’s Ten Most Innovative Companies in Asia, would go on to set a gold standard for blood plasma-derived products, like the human albumin used to keep trauma patients alive and coagulation factor VIII for treating the blood disorder hemophilia. To the bomb shelters. 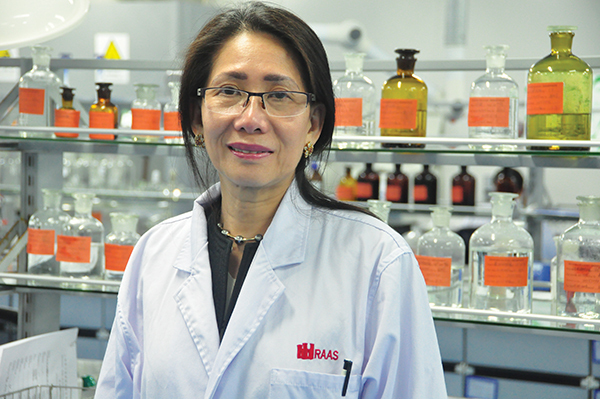 Meecham’s assignment was to start Shanghai RAAS’s laboratories from the ground up. “We had no physical space of our own, so our partner, the Shanghai Blood Center, offered me the bunkers in their basement” – cavernous bomb shelters that dated back to the 1930s and ’40s, when the city was being pummeled by Japan. ­Promoted overnight. When Shanghai RAAS’s general manager quit just months into the job, Meecham went straight from scientist to head honcho. “I had to learn everything,” from how to build a factory to how to hire scientists, engineers and doctors in a country where people didn’t use resumes. “A gentleman assigned to me by our Chinese partner would bring people for me to interview.” She formed a startup team of 50. Today there are more than 2,000 employees. ­Quality. The company’s inaugural goal was to improve the safety and quality of blood products in China. The HIV/AIDS epidemic was raging in the U.S. and Europe, and the disease was moving into China via imported blood plasma. “We pioneered using more sensitive, virus-specific tests to screen raw blood plasma, importing FDA-approved test kits from the U.S.” Shanghai RAAS went on to develop a comprehensive system for screening and production that adheres to the standards of China, the U.S., the European Medicines Agency and the World Health Organization. Meecham has a son, 19, and a daughter, 17, with husband Andrew, who is from the United Kingdom. They live in Shanghai.